There was a time when small cars were used by families and everyone was having more or same the same type of car. But with the advancement of technology cars today are so cheap to produce and there are many different models of cars available on the market. Many persons wants a modern and the latest model car. For them the car can be a symbol for how important they are. If you own a car, you definitely drive from one place to another. While moving from one place to another you maybe want to stick out. And maybe you want to remind people around you that there is a family on-board. This can be achieved through designing your own unique sticker decal. 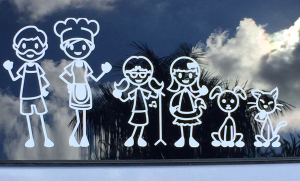 There are tons of window car stickers available on the market. Stickers decals give your car a new and fun look! – You can display your hobbies on your car window with a fully customized decal.